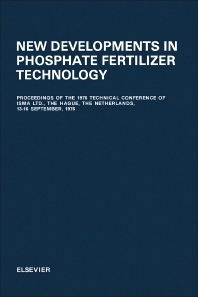 New Developments in Phosphate Fertilizer Technology compiles all the papers presented at the 1976 Technical Conference of ISMA Ltd. Topics covered by this book include process for recycling H2 SiF6 solutions recovered by gas washing; safety in rotary dryer operation; valorization of phospho-gypsum; investigation of an aerosol with pilot units installed on site; windmill Holland and its environment; and agglomerate granulation as an equilibrium process. This book also provides discussions on hygroscopicity of fertilizer materials; handling and distribution of compound fertilizers; slurry ammoniation in complex fertilizers production; full-scale operating experience of the Fisons HDC phosphoric acid process; innovations in slurry process granulation plants; and production of synthetic fluor-spar from waste fluosilicilic acid. Included in each chapter are summaries, analysis of the performance data, suggestions for further research, list of symbols, references, and conclusions. This text is beneficial to students or scientists conducting research on the field of agricultural, consumer, and environmental sciences.